The leaves are changing, the temperatures are dropping, and the scent of Pumpkin Spice is in the air. This can only mean one thing: the fall season is finally here! While you prepare for the change in the weather, however, you should remember to do the same for your vehicle. For a few tips on this matter, continue reading. As the temperatures lower, your vehicle will require a bit more help to get started. For that reason, you need to ensure that your battery is in top working condition. If it isn't, you run the risk of being stranded outside in the cold because the battery doesn't have enough power to get your vehicle running. The end of the year is getting very close, which means that the days are shorter and the nights are longer. As you can imagine, you don't want to face those darker days with faulty lights. 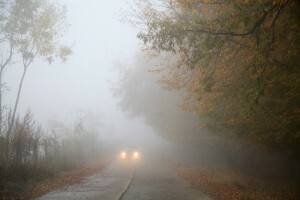 Doing so may affect your visibility on the road, and the other vehicles' visibility of you. To avoid that, check your headlights, brake lights, blinkers, and hazards. Fall gets its name from the changing of the leaves that happens during this season. While this may make the town look beautiful and picturesque, the dead leaves, loose dirt, and other debris on the ground may affect your vehicle's grip on the road. That's why it's especially important that you take a look at the brakes and provide the maintenance they require. Not only should you think about the brakes, the tires should also be considered so you don't slip while you're driving. As you may know, deflated or worn down tires can affect the drive-ability of your vehicle greatly. If you want to make sure that you don't lose control of the vehicle because of faulty tires, check them and keep them in shape (even the spare). Your vehicle requires certain liquids to keep running. The coolant, the synthetic oil, the brake fluid, and more, need to be at the required levels and in the right conditions so your vehicle can work smoothly. However, leaks, dirt, the temperature, and more, can affect their performance. Take a look at them and replace them if needed to maintain your vehicle properly. If you discover that your vehicle needs a synthetic oil change to keep the engine in top shape, contact Lifetimeoil in Isanti at(612) 819-8835. Their line of AMSOIL products, such as the most effective synthetic oil in Isanti, can guarantee that your vehicle will run as new for years to come. With the colder fall air outside and the warmer temperatures inside your vehicle, you will start to notice that your vehicles windows fog up. Needless to say, clouded and obstructed vision is not ideal when you're cruising down the road. Luckily, there's a "Defrost" option in your vehicle that helps correct this phenomenon. You just need to make sure that it's actually functional for when the cold strikes. Speaking of being ready for when the cold air arrives, you may also want to take a look at the heating system. As you may know, the fall and winter seasons in Minnesota can be gruesome. If you don't want to freeze over while you drive, you need to pay attention to the heating system. Have an expert fine-tune it so you're warm and cozy on the road. It's not uncommon for it to start snowing during the fall time. But, again, while having a winter wonderland outside makes your surroundings look gorgeous, having snow on your windshield can be problematic. Having good, functional wiper blades can help you gain your visibility back when the precipitation outside is making it hard for you to see the road and remain safe. Another not-so-pleasant side effect that can come from falling leaves, dirt, and debris during the autumn season, is that your vehicle will get very filthy. Contrary to what you may believe, however, this isn't only a problem for your vehicle's aesthetics. The gunk can actually get in the way of your vehicle's processes and affect their performances, which is why you need to wash your vehicle regularly. Trust in Lifetimeoil for the Best Synthetic Oil in Isanti! Remember that Lifetimeoil in Isanti can offer top quality AMSOIL products for your vehicle's maintenance. Call (612) 819-8835 to learn more about the line, or visit the online store to acquire the best synthetic oil in Isanti. If you'd like to gain financial independence with home-based business opportunities in Isanti, you can also contact Lifetimeoil so they can help you become an independent AMSOIL dealer!